In recognition of Presidents' Day and a recent contact I received from descendants of East Pasadena pioneer and artist William Cogswell, I'm reprising a September, 2008 post. The post tells the story of a rare portrait of Abraham Lincoln that Cogswell painted and gave to the City of Pasadena. City records and an Evening Star article documented the portrait. However, sometime after 1961 the portrait vanished and its disappearance remains an unsolved mystery. Now, let's see if this old blog still works. In an earlier post I presented a short biography of William Cogswell, the famous artist and founder of the Sierra Madre Villa. Cogswell was an amazing guy -- a self taught artist, a 49'er, painter of Lincoln, Grant and others, and an East Pasadena pioneer. The post includes a photo of Cogswell's most famous work, his portrait of President Lincoln, which is the official White House portrait of Lincoln, and today remains as part of the White House Collection. Cogswell's obituary ran on page 1 of the Pasadena Evening Star December 26, 1903. The full obituary is here. The title and lead refer to a Cogswell painting that was a replica of his famous Lincoln portrait and says that the painting hangs in the Pasadena Public Library. In fact, the enterprising Cogswell appears to have painted at least three replicas of his White House Lincoln portrait. One of the portraits is in the California State Capitol in Sacramento and hangs over the Speaker's podium in the Assembly. Correspondence in the Pasadena PL's Cogswell file indicates that a another portrait hung in the Royal Palace in Honolulu, Hawaii. (In 1890 Cogswell travelled to the islands to paint Queen Liliuokalani and Hawaiian royalty). A third Cogswell replica of his White House Lincoln portrait was in the possession of the Pasadena Public Library and the Pasadena Historical Society. It appears the Lincoln portrait hung in the library from at least 1903 to 1961. A 1961 letter to the Pasadena Public Library and correspondence with the Library of Congress and Frick Art Reference Library state that Cogswell's Lincoln portrait belonged to the Pasadena Historical Society and was hanging in the Pasadena Public Library. But, sometime after 1961, the portrait seems to have vanished. So Where is the Lincoln Portrait Today? After learning Cogswell's story and that of Pasadena's Lincoln portrait, I wanted to see the portrait. 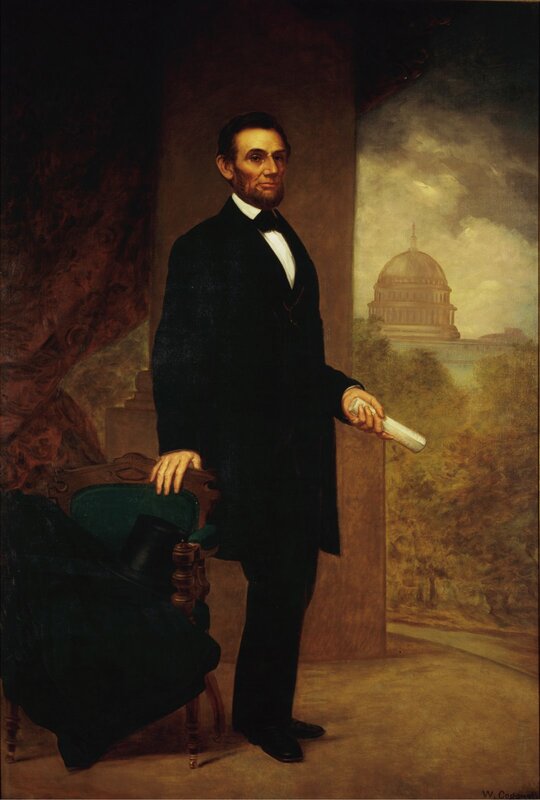 How incredible, I thought, that our library should have one of the few replicas of Cogswell's official White House Lincoln portrait -- a replica like the one hanging in the California State Assembly. And given Cogswell's connection to Pasadena's pioneer days, I thought it very appropriate that the library should have a replica of Cogswell's most famous portrait. So I went to the library to see the painting. But, there was no painting. I called the Historical Museum and the city. But neither had any record of the painting. I emailed the Hawaiian State Archivist asking about the Lincoln portrait in Hawaii. But the archivist emailed back stating they had no record of Cogswell's Lincoln portrait. So, we seem to have a mystery. Based on Cogswell's obituary and the 1961 correspondence, we know that from at least 1903 to 1961 Cogswell's replica of his famous Lincoln portrait hung in the Pasadena Public Library. Based on the 1961 correspondence from the Hawaiian Historical Society, we know that Cogswell left another replica of his famous Lincoln portrait in the Royal Palace. It wouldn't seem that such paintings could just vanish, but that is what seems to have occurred. So, where is the Lincoln portrait that hung for so many decades in the Pasadena Public Library?